MODIS stands for Moderate Resolution Imaging Spectroradiometer. Flying over 700 km above the Earth onboard NASA's Terra satellite, this remote-sensing device observes a variety of terrestrial, oceanic, and atmospheric features of the Earth. 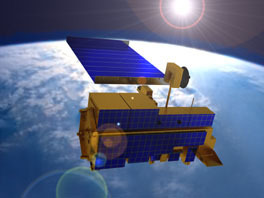 The Terra satellite was launched by NASA on December 18, 1999. The satellite carries five sensors (ASTER, MODIS, MOPITT, MISR and CERES) that study the interactions among the Earth's atmosphere, lands, oceans, and radiant energy (heat and light). Artist's rendering of the Terra spacecraft. Source: NASA.